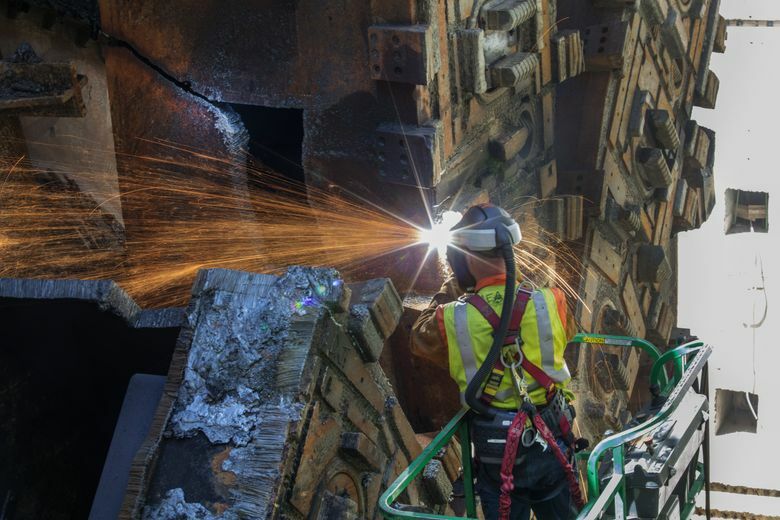 Crews are chopping up Bertha’s massive cutter head and hauling the pieces away to be melted down and recycled. The disassembly is employing dozens of workers, in addition to those building the road decks inside the Highway 99 tunnel. 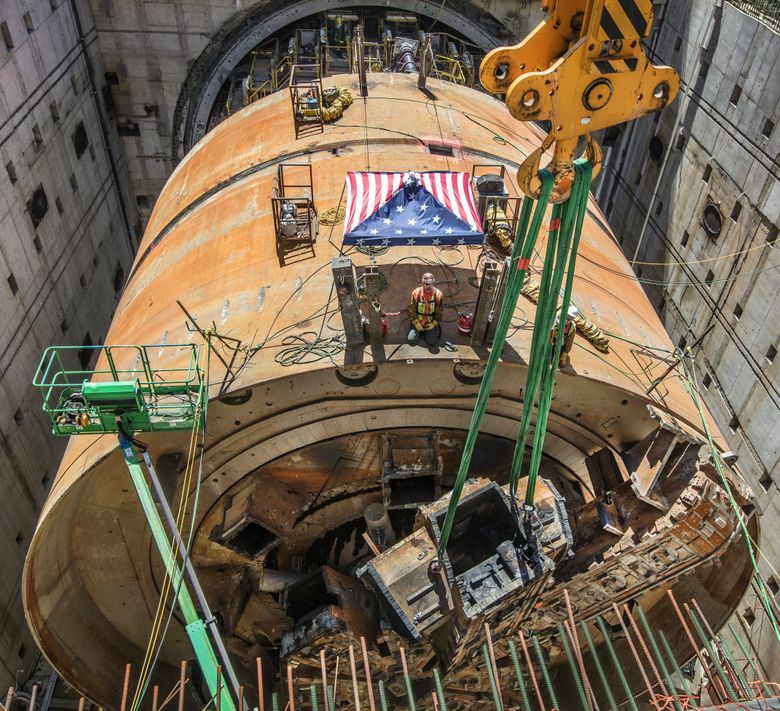 Within a few days, the final pieces of tunnel-boring machine Bertha’s famed cutting disc will be removed and taken to a scrap-metal yard. Only two of the eight longest spokes, plus the center, remained Friday afternoon, after a pair of workers wielding high-power torches sliced away another 100,000-pound piece — still a mere one-third of a spoke. Even in afterlife, Bertha continues to generate jobs. Frontier-Kemper, the disassembly subcontractor, employs 50 people. They are beginning to remove arc-shaped shield pieces and hydraulic thrusters behind the cutter head. Dozens of other workers, predominantly local union members, remain on the job with Seattle Tunnel Partners (STP), continuing to build the road decks of the Highway 99 tunnel. Crane operators hoist the rusty spoke segments over the north maintenance building next to Aurora Avenue North, then lay them in the dirt, to be cut again so they’re light enough to truck out. On Friday, Bertha looked like a hockey player who had caught too many sticks in the mouth. More than 35 lifts will be needed to remove all the pieces from the pit near Seattle Center where Bertha’s trip under downtown Seattle ended. The giant drill’s re-usable trailing gear, more than 200 feet long, will be extracted mainly through the rear of the 1.7-mile tunnel in Sodo. Flatbed trucks carry the scrap crosstown to Seattle Iron & Metals Corp. in the Duwamish industrial area. There, three more workers carve the spokes into yet smaller chunks. Seattle Iron & Metals cuts the pieces to 5 feet by 2 feet by 2 feet so they can be trucked, unloaded and melted down by Nucor Steel in West Seattle, which calls itself the state’s biggest recycler. A few spoke lengths are being saved in case someone wants them as historical artifacts or public art, Thomas said. Talks continue between Hitachi Zosen, the Japanese company that built and owns Bertha, and the Museum of History & Industry (MOHAI) in South Lake Union to save some parts of the machine. 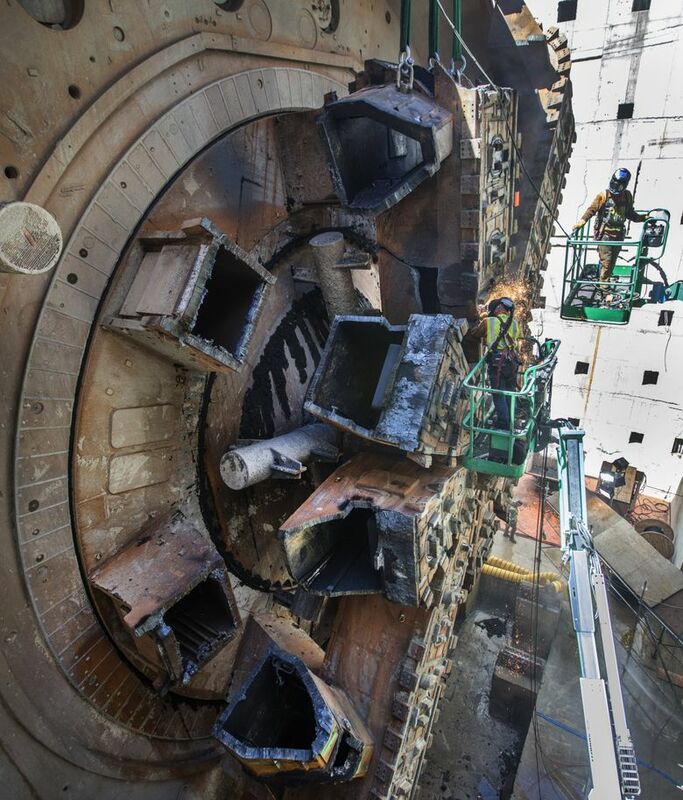 At more than 57 feet in diameter, Bertha was the world’s largest tunnel drill when it was launched on July 30, 2013. It emerged April 4, more than two years behind schedule. The Cascadia Center, a Seattle think tank that introduced international tunnel executives to Washington state leaders a decade ago, recently called on Gov. Jay Inslee, MOHAI and the Seattle Art Museum to preserve parts of the machine. Separately, a Stonehenge-like array of cutter pieces was suggested by landscape architect Guy Michaelsen and artist John Fleming in a Seattle Magazine story. Any large monument would require tens of thousands of dollars, not only to prepare land and a foundation for the pieces, but also to hire a crane and crew to lift them off a truck. The Washington State Department of Transportation (WSDOT) posted video of the first lift of a spoke earlier this month. The 630-ton cutter isn’t being removed as one piece because that would have required a large lift tower, more time and more space. Meanwhile, conveyor belts stretching from the tunnel machine to Terminal 46, near the south portal in Sodo, have been dismantled. Complete disassembly is estimated to take four months, said Chris Dixon, STP project manager. The tunnel highway decks, still under construction, will have two lanes in each direction. The upper southbound roadway is 62 percent complete, the latest WSDOT progress update says. The lower northbound deck, to be made of precast concrete panels, will be installed after Bertha’s trailing gear, including catwalks and utility pipes, is pulled out of the way. Roadway deck work should be done by the end of this year, Dixon said. Additional time is needed to install lane markings, electronic signals and fire-suppression equipment, followed by testing and several weeks to link the tunnel to surrounding roads. The tunnel could be ready for traffic before the current estimate of early 2019, but officials aren’t ready to commit to that schedule yet. A revised schedule is being written, Dixon said. Toll rates are undetermined, but the latest state studies mention a $2.50 peak afternoon rate, and $1.75 peak morning rate, to fund about $200 million in construction debt, plus tunnel maintenance. The downtown tunnel, at $2.1 billion, is the costliest part of a $3.2 billion replacement for the aging Alaskan Way Viaduct. The viaduct will be torn down once the tunnel is open to traffic. Another $480 million in potential cost overruns is in dispute among STP, WSDOT, insurers and Hitachi Zosen.